Used Audi A6 Review - 2004-2011 | What Car? 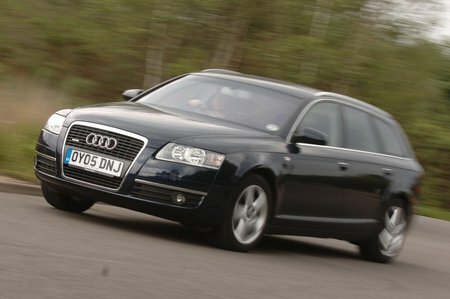 What's the used Audi A6 estate like? The Audi A6 Avant is big in every way: big on space, prestige, equipment and power. It has everything you'd expect of an executive cruiser, with added practicality. Five adults will be perfectly comfortable in the cabin, thanks to generous head, leg and shoulder space all-round and a multi-adjustable driving position. Central to the A6 Avant's appeal is its big boot. Even with the rear seats in place, there's plenty of space for a family's holiday luggage, while with them folded you could use it to move house. Its handling is pretty impressive, too. The A6 Avant changes direction sharply, resists body roll well and grips the road strongly. Front- and four-wheel-drive versions are available, along with optional self-levelling air suspension – useful for those who carry heavy loads on a regular basis. The standard car's ride feels firm over poor surfaces, though.